Make yourself at home in one of our great bars, our lobby bar Post Bar, or Bon Bon Bar on the second floor. Post Bar is at the heart of Clarion Hotel Post and a natural gathering spot for both hotel guests and Gothenburg locals alike. Make yourself at home in Post Bar – consider it your second living room! Besides our own beers, and coffee we roast ourselves, we offer an extensive wine list of interesting American wines. We are also incredibly proud of our pastries, baked in our own café. Choose from a selection of delicious sandwiches if those hunger pangs get a little stronger. The rhythm and feel of the background music depends on the time of day and atmosphere. To appeal to all our guests, the playlists contain a variety of music from popular 1920s classic jazz to current hits. You'll find our stunning Bon Bon Bar above the lobby, on the second floor of this wonderful historic building. This is where a world champion bartender and an Olympic pastry chef come together to create fabulous and unique flavour combinations in gorgeous surroundings that transport you from the 1920s right up to the present day, and beyond! Bon Bon Bar celebrates all kinds of occasions with fairly sourced luxuries, classy Bon Bons and handmade drinks made using sustainable and local Nordic ingredients. This is a social club where classic treats such as caviar, chocolate and cocktails with a twist! As night falls, two worlds collide and the social bar transforms into an amazing nightclub. Prepare for a an experience unlike any other here at Bon Bon Bar! A warm welcome to Clarion Hotel Post's popular after work night – Post work! Every Friday afternoon the atmosphere, music and tempo pick up and people swarm in from the streets and the square, as we celebrate the arrival of the weekend with special prices at the bar from 4pm – 9pm. See you soon! Every hotel of distinction should have its own coffee roast, and the same goes for Clarion Hotel Post. 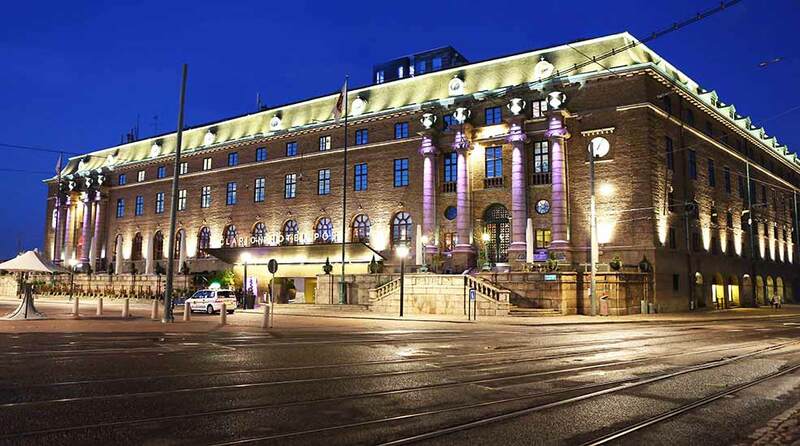 Post Roast is produced by Bergstrand's Coffee Roastery, who have been roasting coffee beans in Gothenburg since 1891. They have now developed a blend just for us, of 85% from Peru, Mexico, Indonesia and Ethiopia and 15% from Tanzania – Robusta. The flavour leans towards espresso, with nutty touches. Strong body, rich and full, with just a hint of a sweet pleasing finish. As if that wasn't enough, we have also developed our own beer in collaboration with Gothenburg-based micro brewery Dugges. May we present: Dugges' Post Lager. Come along for a tasting! The wine cellar in itself arouses curiosity about wine and flavours. Wines from most parts of the wine world are kept here, but the heart of the wine cellar is Oregon, and world class Pinot Noir. The largest selection of Oregon wines outside of Oregon can actually be found right here in our wine cellar. We also offer wine tastings with our talented sommeliers, customised to your taste.